I don't know about you but February is flown by... fast! Our meeting is this Friday so please let me know by Wednesday if you will be attending. Bookie Bell of Checkers Entertainment Service will be our Guest Speaker so come out and support our members! If you are interested in a Display table ($10.00) let me know and that will give you 5 min of talk time as well as a table to display your wares. We will be starting the meeting with our group introductions so have your 1 minute into ready to go! Also, if you are able to bring a door prize that would be wonderful! Our newsletter will be handed out this Friday, if you have anything you would like included, ie: specials, events, tips, etc.. please email them to me by this Wednesday. Well... a new year, a new location and a new look to our website! I think our room at the Queen Street United Church will work out perfectly! Thank you to Charmaine of Wholesome Foods for a wonderful lunch and to Joanne Jehu of Faithlife Financial for her informative talk on personal finances and achieving our financial goals. 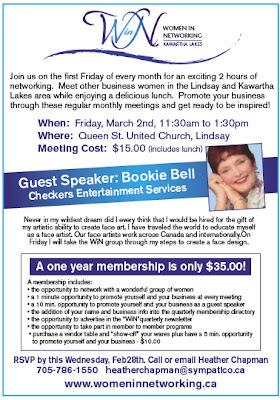 Next months guest speaker is Bookie Bell of Bookie's Entertainment Services... I can only imagine what she has in store for us! Our membership is now at 33! And growing stong! • Please check your link at the right to make sure all information is correct. • Forward any testimonials, tips, insights, etc.. for next months newsletter. 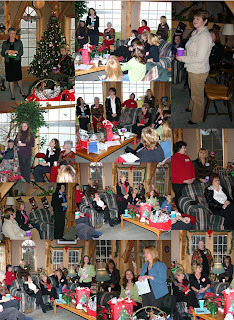 • Let me know if you are interested in being a guest speaker for an upcoming meeting.